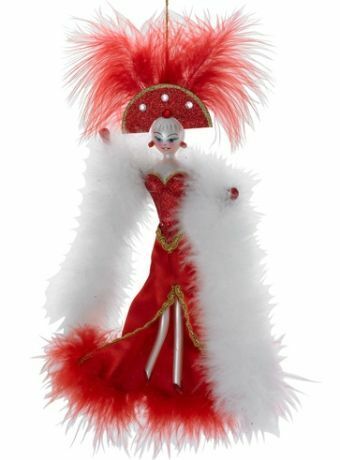 This fabulous dame is one of the highly collectible Radko ornaments personalized by artisans in Italy. The lady in red Radko Italian ornament boasts premium quality and beauty in every detail. Made in limited quantities with outstanding resale prices, this one can be shipped in a pretty Radko box and packaging to enhance its presentation as a gift. Browse all of our Radko Italian ornaments for several other luxurious ladies that complement the radiant Radko lady in red Italian glass ornament very nicely. Characteristics of this item do not permit personalization. GIFT BOX: Click to see gift box for this ornament. Click again to de-select. Gift packaging service includes: removal of all stickers and glue residue; removal of tags except for Radko; interior padding/tissue as appropriate for this ornament. The packaging and service are sized and priced per ornament. If ordering a number of gifts, we will write the recipient's name on the bottom of each box neatly so you do not have to open everything to see to whom it belongs. $7.95. This is the official Radko gift box that Radko has offered for 25+ years. Advantages: saves you time, money and gas from having to go find and purchase a gift box and packaging or an individual-ornament storage box. Misconceptions: it is not a “thick, 250-pound test storage box” or “wrapping”. It is a giftable, wrappable, storable Radko box that protects and presents the ornament. The price includes pack labor with inner shred and/or bubble, box as shown, larger outer shipping box and additional peanuts surrounding gift box to insure the boxed ornament arrives in great shape.